By accessing, reading and making use of this website, you agree to be bound by the terms and conditions below. We reserve the right, at our sole discretion, to modify these terms and conditions at any time without any notice to you. Such modifications are effective immediately upon posting. You agree to be bound by such modifications through your continued use of this website. We recommend you revisit these terms and conditions periodically and your continued use of this website will be deemed as your conclusive acceptance of any modification. These terms and conditions are of general application and shall be read together with and as supplementary to disclaimers, terms, or conditions posted on this website, if any. Please take a moment to become familiar with the terms and conditions. If you do not accept these terms and conditions, you should immediately discontinue the use of this website. This website is owned and operated by Lawyers’ Professional Indemnity Company (“LAWPRO”) in Toronto, Ontario, Canada. Copyright © 1997-2018 Lawyers’ Professional Indemnity Company. All rights reserved. (the “Copyright Notice”) LAWPRO®, the LAWPRO logo, TitlePLUS®, the TitlePLUS logo, practicePRO®, the practicePRO logo, GoodMortgage®, OwnerEXPRESS®, the GoodMortgage logo, Assurance LAWPRO® and the Assurance LAWPRO logo are registered trademarks of LAWPRO. Real Simple Real Estate GuideTM is a trademark of LAWPRO. Certain names, graphics, logos, icons, designs, words, titles or phrases on this website may also constitute trade names, trademarks or service marks of LAWPRO or other third parties. Trademarks may be registered in Canada and in other countries as applicable. Nothing contained in this website should be construed as granting, by implication or otherwise, any license or right to use any trademark displayed on this website. No other use is permitted. Without restricting the generality of the foregoing, you may not make any commercial use of the content, or include the content in or with any product that you create or distribute, or copy such content onto your own or the website of another. You further acknowledge and agree that you do not acquire any ownership rights by downloading the content from this website. Also, without limiting the generality of the foregoing, you may not gather, extract, reproduce and/or display on any other website or other online service, any material on or from this website, whether or not by the use of spiders or other “screen scraping” software or system used to extract data without the express consent of LAWPRO. Any unauthorized downloading, re-transmission, or other copying or modification of trademarks and/or the contents of this website may be a violation of federal or other law that may apply to trademarks and/or copyrights, and such actions could result in legal action. This website and the information provided herein is provided “AS IS”, without warranty, condition, representation or endorsement of any kind whatsoever. Without limiting the generality of the foregoing, LAWPRO makes no warranty as to the accuracy, quality or completeness of the information, nor to title or non-infringement nor to the absence of any software virus or other harmful component. Further, LAWPRO does not represent or warrant that this website will be available and meet your requirements, that access will be uninterrupted, that there will be no delays, difficulties in use, defects, incompatibility, failures, errors, omissions or loss of transmitted information, that no viruses or other contaminating or destructive properties will be transmitted or that no damage will occur to your computer system. You assume total responsibility and risk for your use of this website and assume sole responsibility to evaluate the accuracy, completeness and usefulness of the information provided as well as to ensure that you have taken reasonable precautions to scan for viruses and other items of a destructive nature. It is also your responsibility to ensure that you have a complete and current backup of the information contained on your computer system prior to using this website. The use of hyper links is a free service offered to you by LAWPRO. 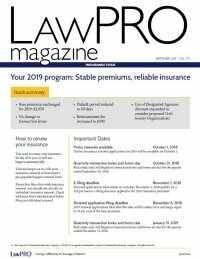 LAWPRO does not control or review, and is not responsible for, any websites linked from or to this website, the content of the websites, the privacy practices of those websites, the third parties named therein, or their products or services. Accordingly, these hyper links and the hyper linked websites are provided without warranty, condition, representation, endorsement or approval of any kind whatsoever by LAWPRO. It is understood that none of the information provided on this website is provided as legal, accounting or tax advice, and you agree that it will not be relied upon as such. If you require any such advice, you should retain the services of a competent professional. In no circumstances shall LAWPRO, or its affiliates, subsidiaries, directors, officers, agents or employees, be liable for any direct, indirect, incidental, special, aggravated, punitive or consequential damages that result in any way from your use of the Internet or your reliance or use of information or services provided on this website, whether on or through this website, its hyper links or any hyper linked websites, or any action or decision made by you in reliance on this website or its content, or any unauthorized use or reproduction of the website or its content, even if LAWPRO has been advised of the possibility of these damages. Some portions of this website may be restricted and require authorization for access. Unauthorized use of or access to these areas is prohibited. Actual or attempted unauthorized use of or access to such areas may result in criminal and/or civil prosecution. Attempts to access such areas without authorization may be viewed, monitored and recorded and any information obtained may be given to law enforcement organizations in connection with any investigation or prosecution of possible criminal activity on this website. If you are not an authorized user of such areas or do not consent to continued monitoring, you should not attempt to access such areas. This website is governed by and construed in accordance with the laws of the Province of Ontario and the laws of Canada applicable therein, without giving effect to any principles of conflicts of laws, and notwithstanding your domicile, residence or physical location. All disputes, controversies or claims arising out of or in connection with this website shall be submitted to and be subject to the exclusive jurisdiction of the courts of the Province of Ontario. You submit and attorn to the exclusive jurisdiction of the courts of the Province of Ontario to finally adjudicate or determine any suit, action or proceeding arising out of or in connection with this website. Last updated on September 3, 2015.